Every city is host to birds and other animals, even in the smallest parks, and depending on how far away you are from home, the fauna you see could be ultra-exotic. Here are ten of the best cities in the world for checking out “feathered sites.” And while you’re at it, tune your ears to the sounds of the local birds. You’ll add a fun new dimension to your travels. 1. New York, New York. Start spreadin’ the news: Everything from egrets to raccoons breed in Central Park. Mini dramas take place every day, such as when a hawk nabs a squirrel. It may not be as intense as the African bush, but the park is a migratory route for a large number of bird species. 2. London, England. St. James Park near Buckingham Palace is the best site in old London for seeing the city’s avian treasure. Not only is it home to local birds, but exotic species from other parts of the world have been placed there. The first time I visited, a man carrying a cane and wearing a bowler hat pointed out the various species for me. 3. Singapore. Both a country and a city, Singapore’s birds can be seen without ever setting foot in a park or nature reserve (although I highly recommend doing so). 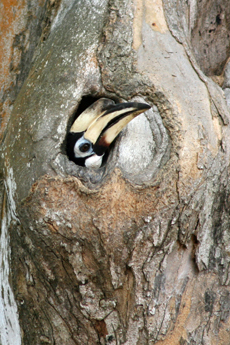 If you pay attention, you can see hornbills and parrots peeking out of their nests in trees next to your sidewalk lunch table. 4. San Francisco, California. The Golden Gate city has beautiful winged ones from feral parrots to native hummingbirds, woodpeckers, and jays. You’ll see some of these as you walk the streets and others when you stroll in the parks. 5. Cape Town, South Africa. Greater Cape Town is home to Table Mountain and the stunning Kirstenbosch National Botanic Garden. While you admire the flowers, watch for the orangebreasted sunbird and the Cape sugarbird with a tail longer than its body. 6. Panama City, Panama. All you have to do in Panama City is listen, and you’ll hear frequent flocks of raucous parakeets flying overhead. Near the Panama Canal, lift your head to look for magnificent frigatebirds. 7. Beijing, China. China’s most visited city is not widely known for its birds, but all you have to do is look to find some glorious creatures. 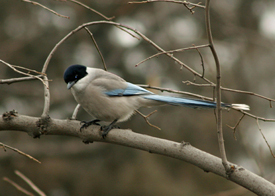 I found one of the prettiest – the azure-winged magpie – in a small park where locals work out at an outdoor gym. 8. Quito, Ecuador. You don’t have to venture into the wild to see this country’s stunning winged creatures. Ecuador has more species of hummingbirds than any country on earth, and you can see some of them in Quito’s residential neighborhoods. 9. Bangkok, Thailand. Well-known for crowds, noise, speed, and smells, Bangkok is also filled with birds. Make your way to Lumphini Park, and check out the many gorgeous cuckoos, drongos, shrikes, and kingfishers. If you don’t know what those are, just raise your eyes to the trees, and enjoy the view. 10. Sydney, Australia. The best city birding experience of my life was at the Royal Botanic Gardens near the Sydney Opera House. A dozen snowy white sulphur-crested cockatoos (the kind we Americans normally see in cages) landed on the ground and walked around me, completely unafraid. Rainbow lorikeets and other beauties fill the garden, making it a birder’s paradise. 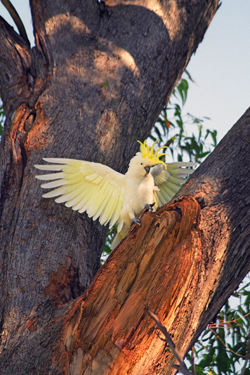 Photos by Melanie Votaw, from top to bottom: Sulphur-crested cockatoo in Australia; Azure-winged magpie in Beijing; hornbill nest in Singapore. Melanie Votaw is the author of 13 non-fiction books and has written for such publications as Woman’s Day, Executive Travel, and the South China Morning Post. She has visited 40+ countries on six continents and has more than 1,000 bird species on her life list. Some of her favorite experiences include flying in a microlight over Victoria Falls, bathing an elephant in the River Kwai, and hunting for a rare hummingbird at 12,000 feet in Ecuador. Melanie lives in the wilds of New York City. NEED HELP PLANNING YOUR TRAVEL? LET US CUSTOMIZE YOUR TRIPS. Where are the Birds in Ecuador? Everywhere.